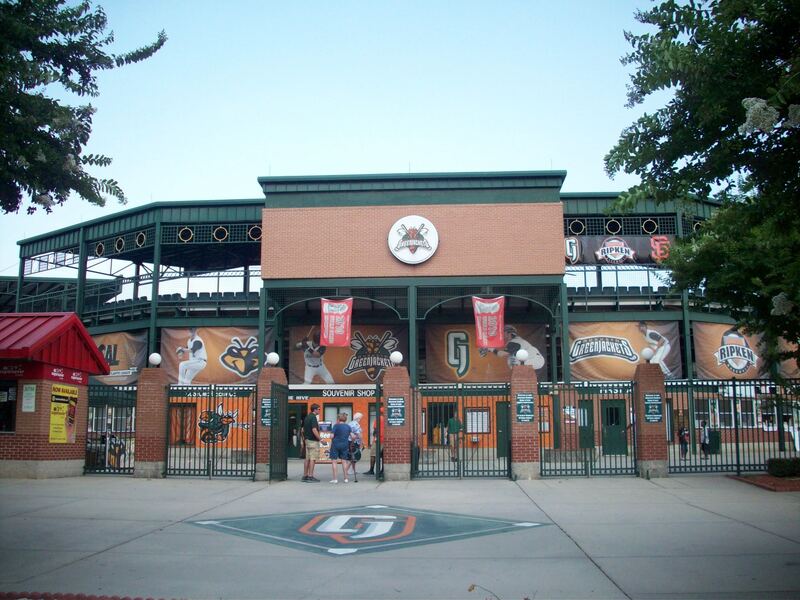 Ballpark Basics: A ballpark that shows Augusta is more than just a golf town. Ballpark Breakdown: Pulling off Highway 20 we took Route 28, the main thoroughfare through town, to get to Lake Olmstead Stadium. On the drive we passed a couple of blocks with run down strip malls on one side and a long white fence on the other. In any other town you would think that maybe a cleaned up industrial area is hidden behind this extremely long white fence. Blink and you might miss the small entrance with the sign “Augusta National Golf Club: Members Only”. Behind this bland looking white fence is one of the most hallowed grounds in the world of golf. For a small town with little else to attract attention you would think there would be tons of signage designating this famous crop of grass. However, if it weren’t for another car that had pulled over to take a picture we wouldn’t have even realized what lay behind the bland white fencing. Continue down Route 28 through the rest of this town whose most applicable adjectives are “sleepy” and “southern” and it will lead you to Lake Olmstead Stadium. 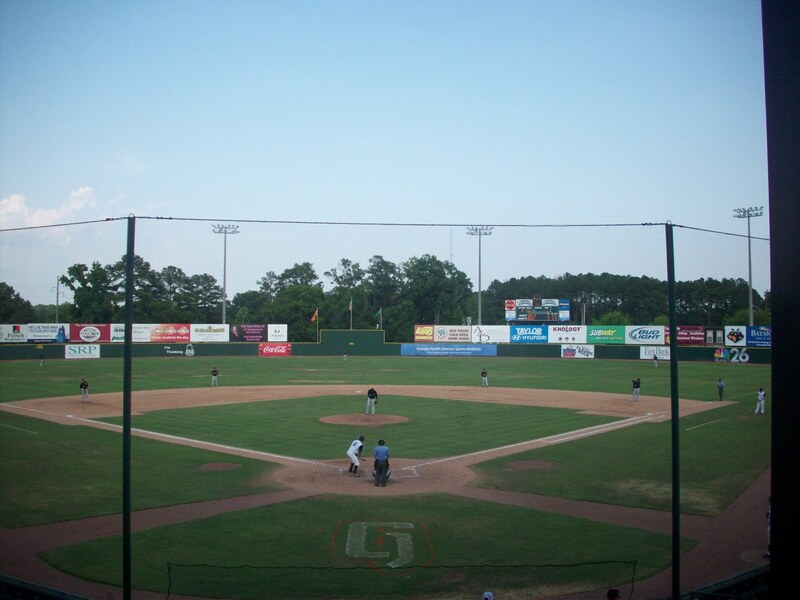 This is the home of the Augusta GreenJackets, whose name is both a nod to the award given to the winner of the Masters and – in our opinion – one of the best names in MiLB. The road that leads up to the stadium curves along the lake that gives the park its name. You can park your car along the shoulder of this road or park in the parking lots adjacent to the stadium. We were there for an early afternoon game and attendance was light so we opted for a spot along street, and ended up parked next to a guy that was actually diving in Lake Olmstead and collecting Frisbees that had met a watery demise for the nearby Frisbee golf course. Walking up to the front of the stadium you are greeted by two ticket booths on either side of the large sidewalk that leads you to the entrance of the stadium. The wrought iron front gates open up to the brick and iron façade of the main grandstand. This gives the ballpark a nice historic feel (older than its 1995 opening at least). The historic charm is carried into the actual ballpark as well. Banners show the history of baseball in Augusta with some great photographs. The outfield wall is painted a lush green with minimal advertisements that are actually painted on the walls (The larger ads placed above the outfield wall). 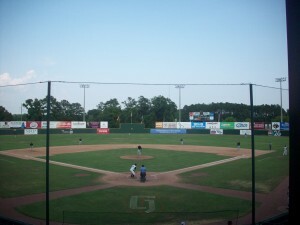 Another great quirk of Lake Olmstead Stadium is the distance marker on the left-center field wall. Simply printed is the distance of .366 with the name Cobb beneath as a nod the baseball great (and his lifetime batting average) who called Augusta home from 1913 to 1932. 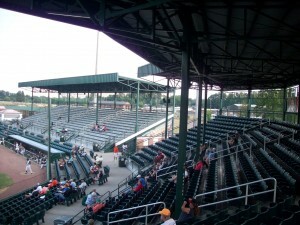 The ballpark is divided into three very basic grandstands covered by corrugated steel (one down each baseline and one behind home plate). The grandstands down the baselines consist of bleacher seating and the one behind home plate has green seats with seatbacks. There are a few rows of seats that sit in front of the grandstands that are divided by a walkway. 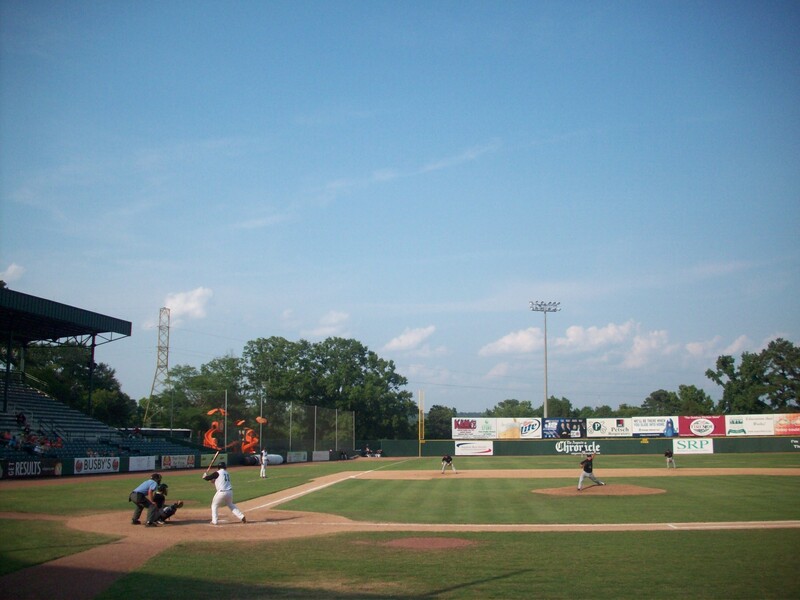 We were there for an early afternoon game and the heat was oppressive, and Lake Olmstead Park doesn’t have a club level, so there is no cover except in the grandstand. Recognizing this stifling heat is a recurring event, the Green Jackets have done what they could to combat it. Above each grandstand is a huge (and we mean really, really big) fan that helps circulate the stagnant humid air during the sweltering Southern summer months. Need more? A cooling station with fans and misting water is found behind the first base side. The kids’ area can be found down the left field line, and is essentially a glorified playground. In the right field corner you will find the On Deck Cafe. With the light attendance for our game, the Grill itself was closed, but the area was open to strolling fans, which provided great spot to find forgotten foul balls and even some batting practice balls (We even found a San Francisco Giants BP ball that had been handed down to their farm team, Score!). Another great part of the park that was not in use during our visit was the party deck next to the café. Located in the right field corner above the storage facility for the groundskeeper it offers a unique view of the field. Unfortunately we were not able to take advantage of it on our visit. The only place where the stadium really disappointed was in the beer department. Granted we were there on an early afternoon game and many of the typical concession stands were not open. However the only options that we could find were the typical big brands. We were not able to find out if they serve any local suds in the On Deck Cafe and for a town without a brewery it was not a surprise for us that they had limited options. Hopefully the next time we get a chance to visit they will have added a couple of craft beers to their menu. 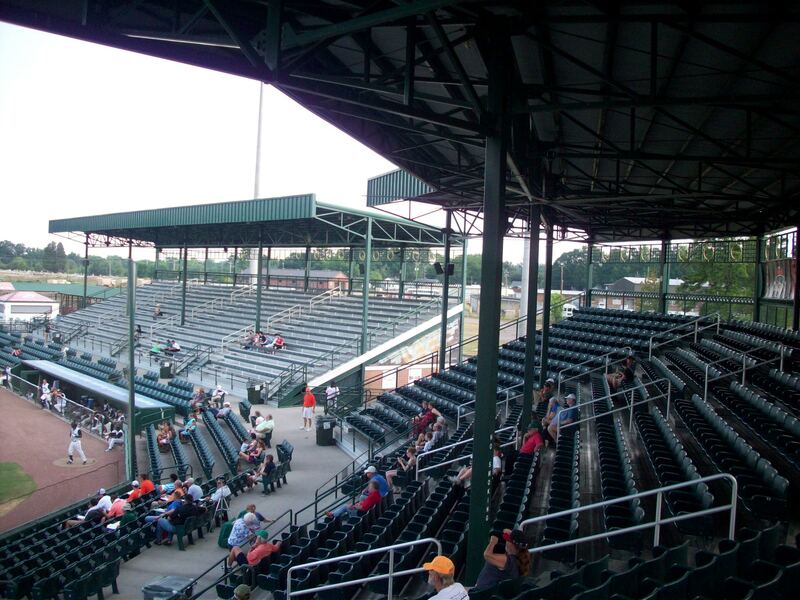 This is a great ballpark in town that shows Augusta to be more than just a golf town, which is good because there really isn’t too much else going on when the PGA isn’t in town. And since the Green Jackets have always seen fit to allow women into their park, it might even be the better bet of the two. Aiken is a very small brewery in a very small town. Driving through Aiken, the downtown comes up suddenly and is a handful of blocks long with a median down the center. 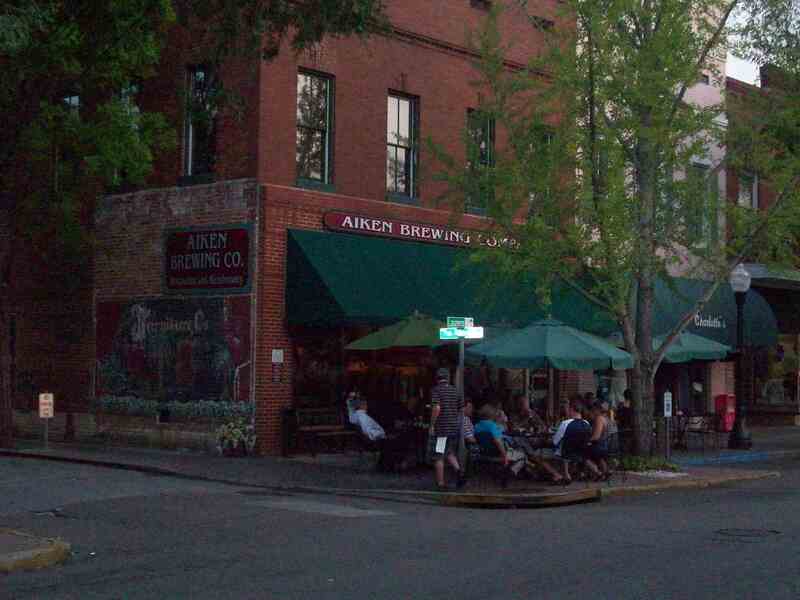 The Aiken Brewing Company is housed in one of the storefronts that line the main streets of historic, downtown Aiken, SC. The big glass store windows house the brew works and kegs and beyond those areas is a divider separating restaurant seating from the bar. 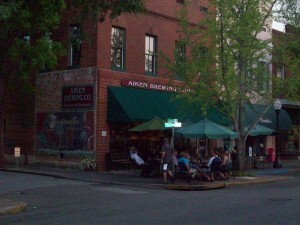 An additional half dozen (or so) tables and umbrellas are out front for people watching on nice evenings. There are some pretty exposed brick walls, but overall the décor is a mix standard dated furnishings along the lines of plastic table cloths, fake flowers and wood paneling. They store bags of malts against the wall of the dining room, and the scent is pronounced when you first arrive. 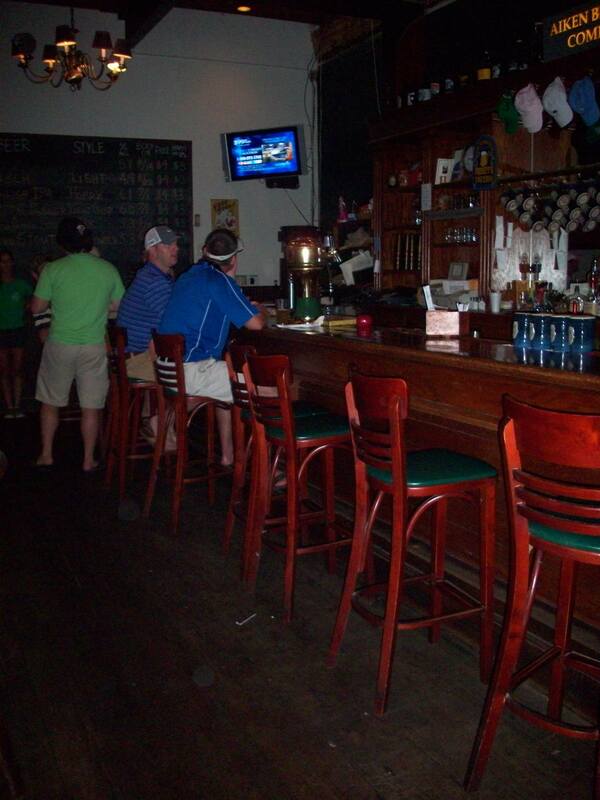 They had a friendly staff, and great hours – especially for a small town. 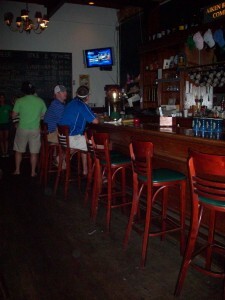 Open till midnight every night except Friday and Saturday when they are open till 2. And of course, in the tradition of southern small towns, they are closed on Sunday. Kolsch 5.7 ABV – Pale with a hint of yellow that smells of wheat and banana. High carbonation at first but then it levels off. Aiken’s kolsch has very light palate almost like a wet champagne, and the banana aroma comes from the type of hops that are used, so it does not actually have a fruity taste. English IPA 6.1 ABV – The color of Pittsburgh Steelers Gold. Another high carbonation beer that doesn’t have a ton of hops in the aroma or a terribly hoppy flavor and just a tiny kick at the end. We would be interested to know the IBU count of this beer, but no one in house that night knew the number. Although it’s an IPA, we aren’t even sure this classifies as a “medium-bodied” beer. This is a good example of what we earlier referenced, for despite a lack of expected hops this was a decidedly good beer, worth ordering again. Czech Pilsner 6.0 ABV – Another very pale beer, but stronger in color than the Kolsch, with even higher carbonation and lots of white head. This pilsner had very little aroma compared to the others we sampled but had more upfront taste. A cool, refreshing beer with earthy malts that (like the kolsch) was a mite wheaty and not fruity. Irish Oatmeal Stout 5.3 ABV – Very nut brown color – a dark chocolate leaning toward espresso hues. The Irish Oatmeal smells of roasted malts, which come through in the palate as well. Silky but still fairly carbonated with a smooth chocolate flavor. Nitro Stout 5.3 ABV – Color is basically indiscernible from the Irish Oatmeal Stout, but the smell is lighter and not roasted. Faintly nutty with a hint of coffee in the swallow, really this one just seemed like a watered down version of the stout above.